Died: 16th September 1916; age 37. Served 1 year & 194 days. Residence: 20, Ernest Street, Ipswich. Enlistment Location: Ipswich; Date: 29th September 1914; Age: 35 years & 6 months: Occupation: Labourer; Religion: CofE. height: 5ft 10 ins, dark complexion, brown eyes & dark brown hair. Service: Home – 29th September 1914 – 7th November 1914 – France – 8th November 1914 – 13th March 1915 – Home – 14th March 1915 – 10th April 1916. Wounded: Gun Shot Wound – left arm 11th March 1915 – sent back to England 14th March 1915. Discharged: 10th April 1916 – Hemiplegic. Originated 20th February 1916 – Hatton’s Camp. Wounded in left heel & through left forearm by shrapnel bullet. Concluded Hemiplegic was not due to military service but if he ever recovers then there will be a loss of power & movement in the left arm due to wound. Character – Very Good. Relatives Notified & Address: Husband of Ellen Calver, of 20, Ernest Street, Ipswich. 1881 De Caux Farm, Rushall, Norfolk. George was a year old and living with his parents. George Calver, 29, an Agricultural Labourer, born Wortwell, Norfolk. Eliza Calver (nee Ringer), 27, born Moulton, Norfolk. 1891 49, Cavendish Street, Ipswich. George was 11 years old and living with his parents & brothers. George, 36, a Labourer – Foundry. William Calver, 7, born Hull, Yorkshire. Joseph Calver, 7, born Hull, Yorkshire. Frederick Ernest Calver, 4 months, born Ipswich. 1901 19, Rose Lane, Ipswich. George was 22 years old he was married and Head of the Household. 1911 57, Cavendish Street, Ipswich. George was 32 years old, a General Labourer – Manure Works. He was married and Head of the Household. George’s father, George Calver died 1900, Ipswich. Dorothy Eva Calver, born December 1901, St. Mary’s Stoke, Ipswich. Frederick George Calver, born December 1904, St. Helen’s, Ipswich. Gladys Rose Calver, born 1908, St. Helen’s, Ipswich. Edward James Calver, born 1910, Ipswich. 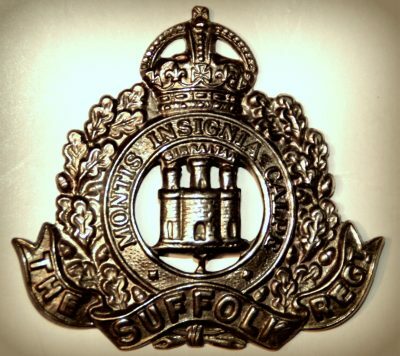 Reginald William Calver, born 1911 – died 1911, Ipswich. Percy Stanley Calver, September 1912, Ipswich. Ellen Ivy Calver, August 1914, Ipswich. George is also remembered on the war memorial under Fire Brigade at the Town Hall, Ipswich. 1 Pings/Trackbacks for "GEORGE ALBERT CALVER"